High Throughput Screenings (HTS) of small molecules in human iPSC-derived cells hold great promise for the identification of therapeutic agents, but they still face substantial challenges in order to adapt the complexities of sophisticated differentiation protocols for a high-throughput scale. We addressed these challenges for two neurodevelopmental disorders caused by symmetrical copy number variations at 7q11.23: Williams-Beuren (WBS) and 7q-microduplication syndrome (7-dup ASD), characterized by, respectively, the hemizygous deletion or duplication of a genetic interval encompassing 26-28 genes. 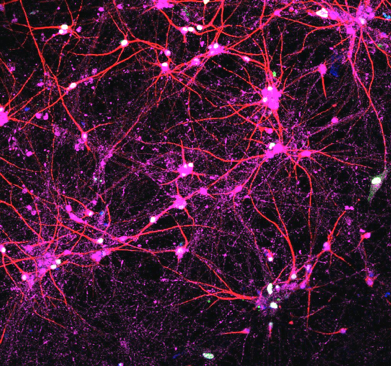 More specifically, this project is focused on performing a HTS of small molecules on cortical glutamatergic neurons differentiated from iPSCs derived from WBS or 7-dup ASD patients, followed by the validation of HTS-derived compounds capable of restoring, at the transcriptional level, the physiological gene expression in the 7q11.23 region. 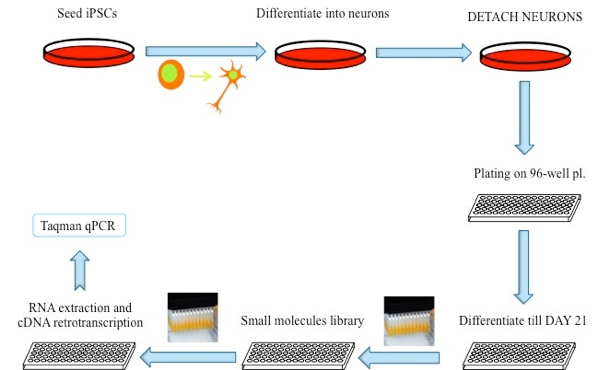 A great effort has already been made to miniaturize the entire differentiation process into 96-well microplates, where both iPSCs and iPSCs-derived neurons retain the same relevant disease-associated differences in gene expression. The automation part of the project is performed in close collaboration with the drug discovery team. These findings pave the way for the disclosure of new leads or the repositioning of available drugs in a critical area of unmet medical need such as intellectual disability and autism.